It all started with a bad smell. In early January a complaint was made to the Osage Nation Police Department that a bad smell was coming from somewhere in the Hominy Industrial Park, said Osage Nation Attorney General Jeff Jones. When ONPD went to investigate they found Osage Tribal Works Department employee Wayne Wilson deconstructing a sewage tank that was about 3-4 feet in the ground. Upon further investigation, they found he was selling the tank for scrap metal and was personally profiting from the sale. On July 22, Jones filed a criminal complaint in ON Trial Court against Wilson for larceny. He also filed a criminal complaint against his boss, Tribal Works Director Daniel St. John, for criminal conspiracy. According to the affidavit, St. John instructed Wilson to deconstruct the sewage tank on Jan. 13. Wilson then transported the metal to Frailey’s Recycling in Turley, Okla., on at least three separate occasions, profiting $838.60. The money was then divided between Wilson and Samuel Brothers, who is Wilson’s neighbor in the Pawhuska Indian Village, and no money was returned to the Nation. Wilson admitted he sold the tank as scrap metal and profited from the sale, according to the affidavit. St. John said he authorized Wilson to deconstruct the tank but not to sell it as scrap metal and was unaware Wilson had sold it, according to the affidavit. According to the Osage Nation property department’s policy, the Nation keeps an inventory of all property and when property is deemed surplus the director of the department fills out an ON Property Transfer/Disposal form. The property department then inspects if the property has any value. If the property is still useable and another department does not want it, the property is flagged for future sale. If the property is deemed unusable the department will be notified to dispose of the property and the property department will mark it disposed. Surplus property is held by the property department for up to 90 days and then offered for sale through a sealed bid process. According to the policy, a notice of surplus property is published in the Osage News as well as other local newspapers and the department with the surplus property keeps the proceeds from the sale. 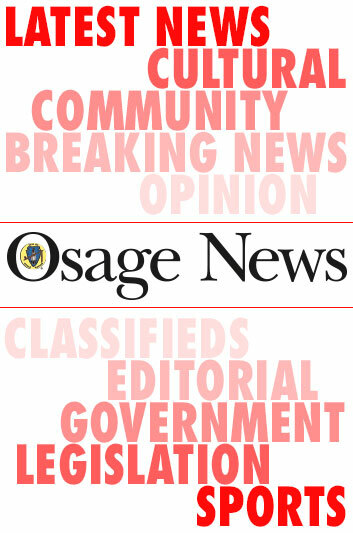 Osage Nation Treasurer Callie Catcher said there has not been a property sale since she has been employed at the Nation and “most of the time, the property is transferred to another program or in some cases it is disposed of as unusable.” Catcher has been with the Nation since March of 2012. The Tribal Works Department is a relatively new department that was formed in 2013 under the Red Eagle administration. The department is responsible for the maintenance workers, the Hominy Industrial Park, the Wah-Sha-She State Park and the Nation’s Mailroom. St. John was responsible for more than 30 employees and four budgets of about $4 million, he said. For this job he was paid roughly $60,000 a year. "Trying to solve the problem and trying to save the tribe money are the two things that got me in trouble. If I would have just hired a contractor and spent thousands of dollars, nothing would have become of this," he said. "I did not give the order for [Wilson] to remove that tank, despite his statement." St. John was terminated on July 30. According to St. John, his expertise includes 20 years of residential and commercial construction, in California and Washington State. Years spent as a construction contractor, and later a construction educator with the National TARO office in Washington. Working for TARO he traveled across Indian Country teaching construction training to tribal members from the Crow Nation, Standing Rock Sioux, Ojibwe and Red Lake, to name a few. He’s a Department of Transportation OQ Certified gas valve and pipeline inspector. He has some college but not a degree. The charges brought by Jones caught him off guard, he said. He thought he had made a clear explanation of the events but understood the charge and felt it was more or less a charge of moral turpitude. St. John and Wilson are scheduled to appear in ON Trial Court on Aug. 14 at 10 a.m.
St. John said he wanted people to know he isn’t some guy off the street, that he is Osage and a shareholder with long roots in the community. He grew up in California, visiting his grandmother Ida Mae Hendricks and cousins in Pawhuska every summer. He’s a descendant of Eliza Tinker, who was sister to General Clarence Tinker. Eliza was his great-great-grandmother and an original Osage allottee. She married Julian Trumbly of Pawhuska. He said he is a direct descendant of Chief White Hair. He moved to Pawhuska in 2011 and was hired by the Nation in 2012 to work in the Properties Department. He said almost everyone that works for him would say he was fair, but firm. He’s not mad at anyone but regrets the entire situation. Many in the Osage community, on the other hand, know Wilson. Raised in Pawhuska and a member of a prominent Osage family, Wilson has worked in the maintenance department for 23 years and knows most of the Nation’s Osage employees. Wilson said it’s been routine over the years for maintenance to move surplus property from department to department or to various storage facilities the Nation owns.